It’s hard to be iconic for more than fifty years. Few have been able to do it. But then again, few things in life are as consistent and legendary as the Ford Mustang, having just recently celebrated its golden anniversary out on the streets, highways, and racetracks of North America. And this year, the iconic dark green Mustang BULLITT is back! You can find the 2019 Ford Mustang here at Metro Ford in Port Coquitlam, BC. 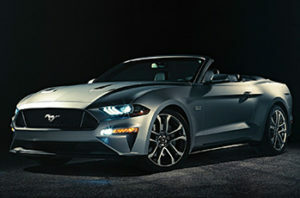 The new 2019 Ford Mustang is available in either a coupe, slightly lowered and made sportier, as a convertible or the BULLITT version. And even though each of its two available engines are able to hit more than the 300 horsepower mark, Ford has made the interior quieter and more refined. Though some Mustang drivers might consider the sound of revving and roar of the V8 engine as a selling feature, convertible owners might still like the insulated and quick-lowering cloth top. 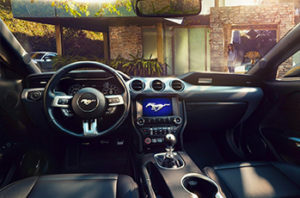 The 2019 Mustang is available with the new Sync 3 infotainment system with its simplified interface. Also, the convertible, the coupe and the BULLITT get the optional GT Performance package, and all GT models gain secondary turn signals integrated into the hood vents. Available bundles include the Black Accent and the California Special GT packages. As the 2019 Ford Mustang arrives at our Ford dealership, be sure to be one of the first people to test drive one of these two-door cars from this special minting. We carry plenty of new and used Ford Mustang vehicles in all different kinds of trims, years, and colours, so you are bound to find the one that best matches your revving-at-a-red-light fantasy. Metro Ford is located in Port Coquitlam, just a short drive from Maple Ridge, Port Moody, Pitt Meadows, Burnaby, and Surrey, BC. The Ford Mustang has a turbocharged 2.3L EcoBoost engine. Small and just four cylinders, yes, but eruptive with 310 horsepower and 350 lb.-ft. of torque. This new kid on the engine block will be offered alongside the familiar hulking 5.0L V8, and at 460 horsepower and 420 lb-ft of torque, it is the quintessential option. For those who demand ultimate performance, the Mustang BULLITT use a unique 5.0L Ti-VCT V-8 engine that makes 480 horsepower and 420 lb-ft of torque. 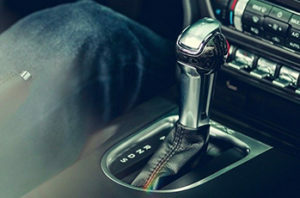 Most engines are available with either a 6 or 10-speed automatic or manual transmission. When you step inside the cockpit of the new 2019 Ford Mustang, you recognize right away that this is a vehicle for driving, not for shuttling. The low-ceilinged, two-door coupe and convertible design acts as a polite and subtle way of suggesting that a third passenger should scram for the time being, similar in function to a tie around a door knob or a yawning party host. You’ll find yourself staring at and admiring the new Mustang’s aviation-themed instrument panel, with its stallion-emblazoned special touches. The Sync 3 interface is super user-friendly, using smartphone-type features like swipe and zoom to help you navigate your music and apps much easier. If we’ve learned anything from previous model years, it’s that the Ford Mustang doesn’t make performance gains at the expense of safety. 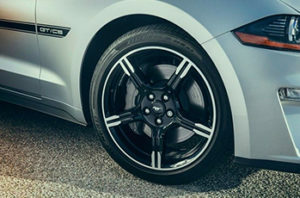 The new Mustang has standard features like antilock disc brakes, traction and stability control, front-seat side airbags, side curtain airbags (coupe only), a driver knee airbag, and a rearview camera. Ford’s MyKey parental controls is another standard you’ll like, and hill-start assist is standard for manual-transmission models. And with optional blind spot monitors and cross-traffic alert, you won’t be surprising other drivers with blind maneuvers anytime soon. Don’t let the performance of your Ford Mustang suffer from neglect; be sure to bring it into our Metro Ford Parts & Service Centre for regular tuning and maintenance, and save yourself from driving towards costlier repairs down the road. Our Parts Departments puts you in supply of the aftermarket Ford Mustang performance parts and custom accessories that you want to stand out on the road, with fair prices and expert installers. When you’re ready to shop for parts, please be sure to order them online from Metro Ford.